This is another incredible opportunity to own a truly authentic signed treasure from Frank Sinatra. 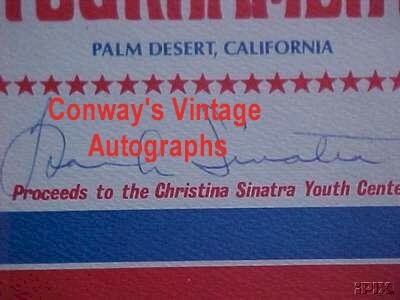 Unlike most Sinatra signed items this is the real thing. If you know his signature you know that 90% of his material on the market is forged or secretarial. Except for e-bay where as high as 95% are NOT authentic. Below is a statement from the person who received this. He has included a letter detailing how and when he got it personally from Sinatra. "A beautifully signed program from the 1974 tennis tournament to benefit the Christina Sinatra Youth Center. Christina Sinatra, is Frank Sinatras daughter. 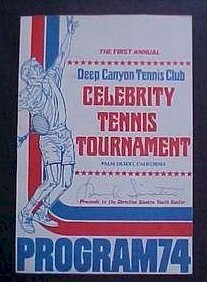 The tournament was held at the Deep Canyon Tennis Club in Palm Desert California. I was a ball boy at the event, and I obtained the signature in person."